Machine learning is a powerful tool for the transformation of data management, and with increasing amounts of data in an organization’s possession, it is more vital than ever. 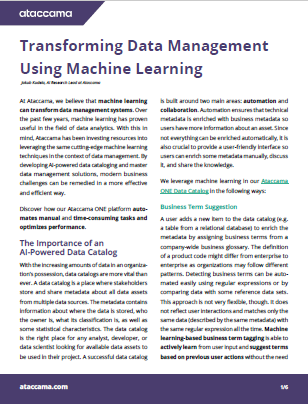 Learn how Ataccama leverages cutting-edge machine learning techniques to automate manual and time-consuming tasks and optimize performance. By developing AI-powered data cataloging and master data management solutions, we can help stem the tide of data chaos and ensure that your data is orderly, correct, and easy to find.